ESPN Networks to Present Ninth Consecutive Year of Live Comprehensive National Signing Day Coverage February 5 - ESPN Press Room U.S.
ESPN will kick off the 2014 college football season with its ninth year of comprehensive, multiplatform National Signing Day coverage on Wednesday, Feb. 5. at 8 a.m. ET. ESPNU will present an 11-hour ESPNU National Signing Day Special providing analysis from recruiting and college experts, reporters on college campuses, and top recruits announcing their decisions live. The entire ESPNU telecast will be available on WatchESPN and simulcast on ESPN2 from 5-5:30 p.m.
ESPNU National Signing Day Special will originate from ESPN’s studios in Charlotte with Rece Davis (@ESPN_ReceDavis) and Dari Nowkhah (@ESPNDari) serving as hosts. ESPN national recruiting director Tom Luginbill (@TomLuginbill) will be a staple throughout the day with analysts David Pollack (@DavidPollack47), Robert Smith (@ESPNRobertSmith), Danny Kanell (@DannyKanell), and Mike Bellotti. Recruiting analysts Craig Haubert (@CraigHaubert) and Gerry Hamilton (@HamiltonESPN) will give further insight into what impact the freshmen class will have on their respective teams from a second set in Charlotte. Note: A 12th school will be added in the coming days. Recruiting Day Expert: ESPN national recruiting director Tom Luginbill has been on the set for each of ESPNU’s eight years covering National Signing Day and this year will be no different. He is the go-to resource when evaluating the next generation of football talent each year. Throughout the year, Luginbill makes regular appearances on Recruiting Nation and as a field analyst on ESPN’s Saturday noon college football games with Dave Pasch and Brian Griese. Live Commitments: A minimum of 13 top recruits are scheduled to make their college announcements on ESPNU National Signing Day Special. This year’s class adds to an impressive roster of players who have declared their college decision live on ESPNU, including 2013 No. 1 recruit, Ole Miss defensive end Robert Nkemdiche and 2012 No. 1 recruit, Florida State defensive end Mario Edwards, Jr. Since 2006, over 67 football players have announced their college destinations live on ESPNU’s National Signing Day coverage. Unprecedented Insight: Since 2006, ESPNU has been the defining home of National Signing Day. 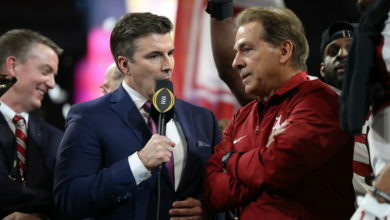 Led by national recruiting director Tom Luginbill, ESPNU’s recruiting and college analysts offer unprecedented insight into the annual event which kicks off the college football season. Via ESPN MediaZone, a look back at key moments, quotes, and highlights of ESPNU’s 2012 and 2013 National Signing Day coverage. Social Media: ESPN will be active on Twitter throughout National Signing Day. Player announcements will be shared via @ESPNCFB. The @ESPNU handle will provide highlight packages for a number of top recruits once they sign. Also, @RecruitingESPN will offer player commitment predictions and updated school rankings throughout the day. Fans can take part in the conversation by tagging their tweets with #SigningDay. ESPN.com: Fans can learn more about the No.1 recruit in the in ESPN 300, running back Leonard Fournette from New Orleans, LA and No. 16 in ESPN 300, quarterback Deshaun Watson from Gainesville, GA via ESPN.com’s videos features: Fournette and Watson. Recruiting Nation: Fans can interact with experts on RecruitingNation.com via live chats starting at 8 a.m. and continuing throughout National Signing Day. Additionally, at the conclusion of National Signing Day, Recruiting Nation will rank the top 75 recruiting classes and provide grades for all major conference programs. Exclusive ESPN3 Content: ESPN’s flagship recruiting program, Recruiting Nation, will carry three, 30-minute exclusive shows on ESPN3 at 10 a.m., 2 p.m. and 6 p.m. Reporters Derek Tyson (@DerekTysonESPN) and Tom VanHaaren (@TomVH) will summarize the National Signing Day landscape and look ahead at the day’s anticipated news. Additionally, ESPN3 will carry four shows which focus on National Signing Day at Florida State, Georgia Tech, NC State, and Pittsburgh. The day before National Signing Day, The ESPNU National Signing Day Preview on Tuesday, Feb. 4, at 3 p.m. will provide an all-encompassing summary of the college football landscape heading into the 2014 season. The two-hour telecast will be hosted by Nowkhah with analysts Bellotti, Smith and Haubert. A special one-hour College Football Live will follow the preview show on ESPN2.